Need that blanket that’s not too hot, but not too cool also? Meet the Leesa blanket! I’ve been a big fan of the Leesa mattress for quite some time. It was one of the very first mattresses I tested on Sleepopolis and it continues to be one of the best mattress choices available on- or offline. Can the new Leesa blanket live up to these lofty expectations? Continue reading below to find out! The Leesa blanket is made from 70% polyester, 17% viscose, and 13% nylon. The build is very similar to the materials used in the cover of their mattress.The blanket is also double sided in order to add comfort and a stronger overall build quality. Additionally, Leesa uses a whipstitch edge to seal off the blanket and add a smooth finish all around. Whipstitch edges help secure the blanket’s double sided construction along with a more durable and longer-lasting enclosure. 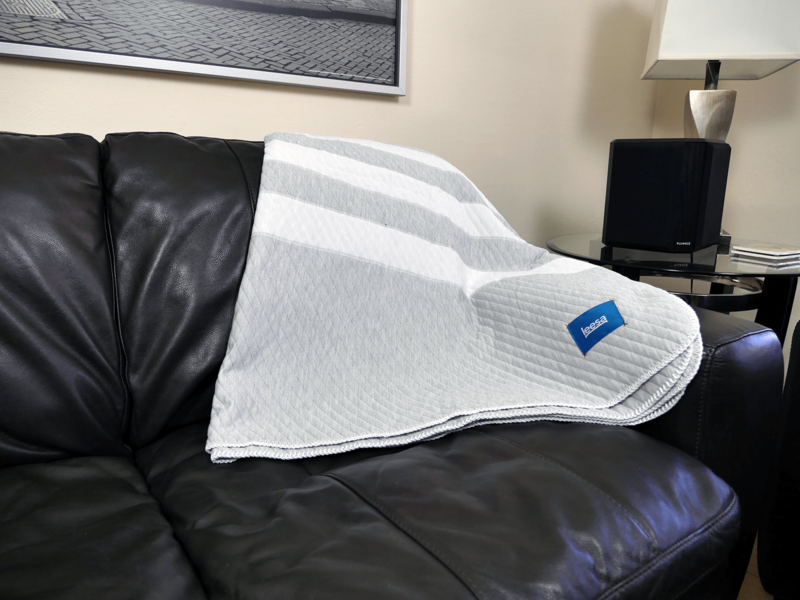 The blanket is machine washable and measures 60″ x 78″. Overall, the Leesa blanket has a very strong build quality. I determine this by analyzing every angle of the blanket, including stitching, material quality, and overall construction. After examining the blanket, I was not able to find a single loose or out-of-place thread. Leesa did a great job of ensuring the stitching was tight all the way around the blanket in addition to the smooth knitting that makes up the top and bottom pieces of the blanket. All in all, the Leesa blanket seems very well made. While testing the Leesa blanket I kept my focus on a few critical topics. For starters, shrinkage. Although blankets are not washed as frequently as sheets, we still want to be sure we’re not purchasing a blanket that’s going to shrink dramatically after a standard was cycle. Following the shrinkage test is a damage test. Are there any loose threads? Did the blanket take on any damage while going through the washer and dryer? How did the blank do after months of use? Shrinkage is not a topic that should be overlooked. In order to determine the overall shrinkage of the blanket, I fist take measurements that will serve as my baseline (prior to wash / dry cycle). Next up, I run the blanket through the washer and dryer and take new measurements immediately following the conclusion of the wash cycle. After doing so, I compare the two sets of measurements to determine how much the blanket shrank. 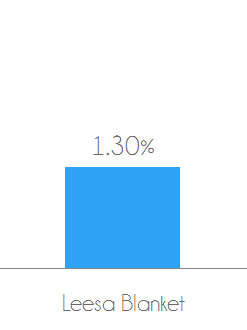 Once I compared my original measurements to the new set, I saw only 1.3% of shrinkage from the Leesa blanket. As a side note, the Leesa blanket did measure just shy of the width specs they have listed on their site (58″ instead of 60″). That said, the blanket could easily be stretched to the appropriate width, but the materials used tend to maintain a tighter elasticity. Throughout this test, I take a deeper look at the blanket for any additional damages that could have occurred from months of normal use and a few wash / dry cycles. Upon further review, the Leesa blanket seems to have held up well. In comparing the brand new Leesa blanket to how it looked after several months of use there was no notable damage or signs of wear-and-tear. The Leesa mattress is one of my all time favorite mattresses I’ve tested on Sleepopolis and a big part of that mattress is the cover. Leesa’s new blanket is a beautiful embodiment of that cover. The double-sided construction offers a soft and comfortable feel overall. On a scale of 1-10, where 1 is the softest, I would say the Leesa blanket lands around 3 out of 10. The Leesa blanket strikes a nice balance of both breathability and warmth. I would describe it as a medium to light medium weight. As such, it’s a perfect choice for summer or when you need a lighter blanket. I live in Phoenix, Arizona and have been using this blanket as a comforter replacement during the warmer summer nights. The Leesa blanket has a style that mimics their mattress, modern yet luxurious. The look of this blanket could most certainly help round out any room and even work as a focal point. Personally, I’m a big fan of the style and overall aesthetic. My wife and I have gone through several blankets and throws, but none have meshed with our style quite as well as Leesa. Should I buy the Leesa blanket? Want a soft & light blanket – the double-sided constructed of this blanket offers a nice, soft feel. Additionally, the blanket is not too heavy, allowing it to comfortably rest on your body without feeling trapped. Want a durable blanket – this blanket uses a whipstich design around the edges in addition to top notch knitting on the top and bottom of the blanket. The material weight of this blanket also adds to the high quality build and helps to further improve durability and longevity. Want a modern style – Leesa’s 4-bar design and simple colors work well in almost any room or decor setting. 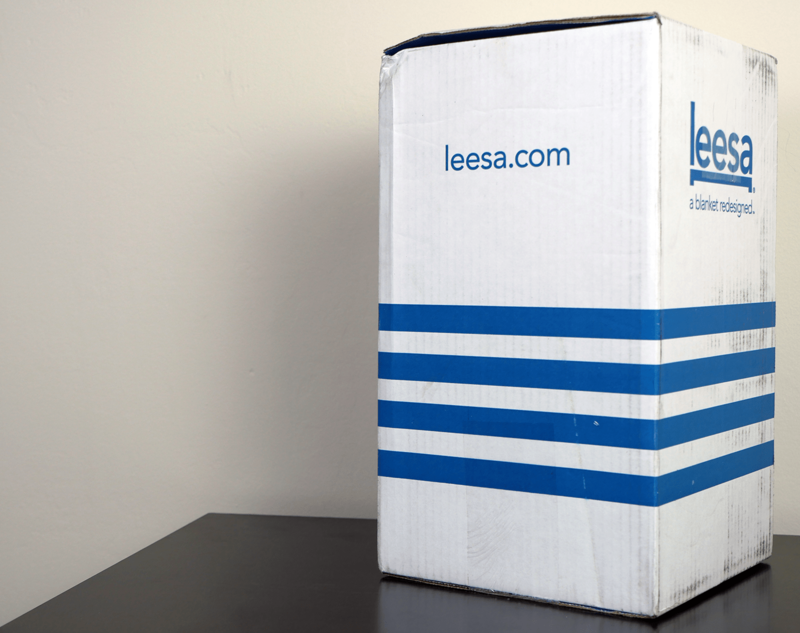 Want to buy from a reputable company – Leesa is a company who prides themselves on giving back to the community. Since their launch in 2014, they have donated over 5,000 mattresses to those in need. For those who want to purchase products from the companies who truly have others at the forefront of their heart, Leesa is definitely one to keep in mind. Looking for more information on the Leesa blanket? Visit Leesa.com. One final note on the review scores below. Sleepopolis does not give out 5 stars often, in fact Leesa’s blanket is the only bedding or mattress product I’ve tested to earn a 5 star rating overall. To achieve a perfect rating on Sleepopolis is not something I take lightly, but Leesa has absolutely earned it with their blanket. I am extremely impressed with this blanket. Extremely comfortable, great balance of being warm but not too warm, and an utterly flawless build. The Leesa blanket is one of a kind. Constructed from a blend of polyester, viscose, and nylon, this blanket is designed to keep the sleeper comfortable, while offering an extremely durable build. Double-sided comfort capped off with flawless stitching combine for one of the nicest sleeping accessories Sleepopolis has tested to date.